Moisturizing Shave Cream Nourishes and moisturizes while you shave. With aloe, natural vitamin C & E, herbs, minerals, and intense moisturizers & natural anti-irritants. Hair loss, dandruff and damaged hair, are in many cases the result of products used for caring for your hair. Most shampoos are detergent based and strip the scalp of essential oils, creating brittle hair, dandruff and destroy the natural PH of the scalp. Waxes, oils and chemicals used in such products also damage the scalp as well as block the hair follicle & impede the proper cleansing of the follicle thus creating hair loss. The ultraNutrient™ Natural Line of Hair Care is designed to stimulate hair growth, repair the damage caused by poor treatments & to restore and nourish your scalp and hair to a healthy glowing condition. A revolutionary weightless hair treatment that nourishes your scalp and strengthens your hair with out that greasy heavy feel of most conditioners. Infuses the hair and scalp with rich botanicals ,broad range anti-oxidants, liposomes exclusive humectants, vitamins and minerals for thicker, fuller, healthy hair. Pure & natural with the rich vitamin & mineral magic of seaweed, the anti-oxidant , anti-aging power of green tea, antiseptic slippery elm, plus soothing willow bark & spearmint. No Alcohol. Plus the complex natural aroma of sandalwood & anise. A premium gentle, daily shampoo infused with luxurious Pure Silk for shiny & vibrant hair. A Non-Soap, Non-Detergent shampoo that moisturizes & conditions with Goat's Milk. Including a Natural & Organic, delicious blend of aromatic, anti-oxidant rich herbs for a healthy scalp. Especially formulated for people with sensitive skin. Pure & Natural for beautiful hair. Great for normal hair. Excellent for dry damaged hair. Revitalize your hair and scalp with Seaweed based UltraNutrient Shampoo. A non-soap, non-detergent shampoo, designed to gently cleanse the scalp and hair while it thickens, moisturizes and strengthens. Rich botanicals, liposomes, humectants, revitalizing sea plants and exclusive ingredients restore damaged hair & help maintain a healthy scalp. Thicken and repair your hair with this all natural sea weed based Hair Loss Treatment Shampoo of numerous needed hair nutrients. Healthy hair starts with a healthy scalp....HAIR REGROWTH treatment SHAMPOO nourishes the scalp, deep cleanses, and activates the hair folicles Plus clinically proven ingredient Procapil™ containing two active substances of plant origin 1) Oleanolic Acid (extracted from roots of Loveyly Hemsleya) and 2) Apigenin (flavonoid extracted from citrus) for vasodilation. PROCAPIL™ is a potent Anti-Hair Loss complex that targets the three phenomena responsible for hair loss. 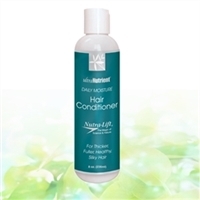 Revitalize your hair and scalp with this Seaweed based, multi-vitamin, herbal ,peptide complex NUTRA-LIFT® UltraNutrient Hair Regrowth Treatment Shampoo. As with any Natural or Pharmacuetical product...Results May Vary. 8 OZ bottle. DIRECTIONS: Apply to wet hair and scalp. Massage into rich lather. Allow to set on hair for approximately one minute, so vitamins & nutrients can penetrate the scalp. Rinse. Repeat if necessary. Then use UltraNutrient Conditioner for best results. Include NUTRA-LIFT® INSTANT RESULTS Hair Regrowth Treatment spray, also daily as directed...to increase hair growth, for thicker silkier healthy hair. Thicken and repair your hair instantly with this all Natural Hair Loss Treatment of numerous needed hair nutrients. Plus clinically proven ingredient Procapil™ containing two active substances of plant origin 1) Oleanolic Acid (extracted from roots of Loveyly Hemsleya) and 2)Apigenin (flavonoid extracted from citrus) for vasodilation. PROCAPIL™ is a potent Anti-Hair Loss complex that targets the three phenomena responsible for hair loss. Clinical studies show 121% increase in hair shaft growth within 14 days. Continual moderate hair growth within 30 days, sustained use over 4 months with even more improvement. As with any Natural or Pharmacuetical product...Results May Vary. 4 oz. spray. Directions: Spray onto clean areas of scalp that need improved hair growth at night, let dry & leave on overnight. Can be applied again in the morning. Can be keep on scalp for extended time period. Wash off "IF DESIRED" with natural shampoo 8 hours after application, or when you NORMALLY wash your hair. Repeat Application every evening and morning. Discontinue use if any noticeable irritation or serious rashes occur, which may in very rare cases.